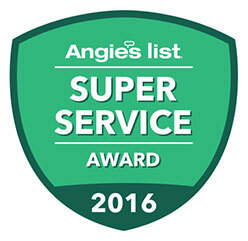 Rolling Garage Doors & Gates Earns 2016 Angie’s List Super Service Award reflecting an exemplary year with an Overall Customer Service “A” Grade, Recent Grade & Review Period Grade Rating. ALTA, CA – Rolling Garage Doors & Gates earns esteemed 2016 Angie’s List Super Service Award. This prestigious award reflects Rolling Garage Doors & Gates’ consistently high level of customer service. Rolling Garage Doors & Gates earned the Home Service Industry’s coveted Angie’s List Super Service Award, reflecting an exemplary year of customer service to members of the Garage Door and Driveway Gate Services Marketplace and the Angie’s List Consumer Reviews Site in 2016.